Some flash flooding occurred from storms over the Northern Gold Coast and SE Brisbane suburbs. Top fall was 142mm, but many were in the 100 to 130mm range. The bulk of this fell in an hour so quite intense. At my place we had gusty winds and heavy rain as a weakening gust front passed over from 4.45pm. A bit of lightning but nothing very exciting. Report 7th February 2008 Storms and heavy rain. Yesterday was one of those days that even a glimpse outside the window and I could tell without models storms were to occur. Being at a swimming carival, I was able to watch the development occur with daytime heating. Altocumulus began to heap up. Some cumulus developed namely over the ranges. But it was the southern and southwestern skyline that developed predominantly and an anvil finally passed over during the early afternoon period. Within the hour, we had torrential rain that lasted about 20 minutes. The lightning activity was not so intense but as the core passed to the northeast, the lightning frequency and intensity seem to maximise. After the main core had passed, a shelf cloud developed along leading edge of the outflow boundary forming along the western part of the core. This was quite picturesque but unfortunately no pictures. Here is a panorama of the cell from the 6th SW of Penrith. This pano was shot during the later stage of this storm just before it became fully outflow dominant. Majestic and vibrant looking guster there Jeff. 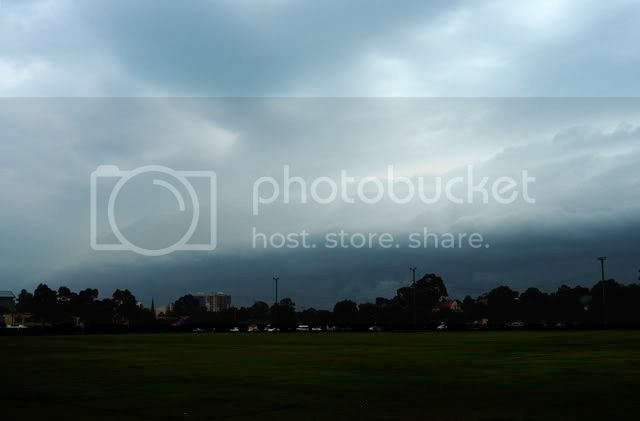 The following photo is from the 6th of February 2008 of the guster as it approached Parramatta from the sw. Visibility was not the best due to light rain from another cell to the north.Cheers, Con. 6th Feb: The cell that rolled off the Blue Mountains and then went onto to pummell Western Sydney was certainly a sight to behold. Racing to the nearest vantage point (on foot) when I heard those first few rumbles, what confronted me to the not too distant west, had me standing in awe. The structure and myriad of colours was amazing to watch as it built. I was at Werrington at the time, and what followed here was some very heavy and consistent rain, and occasional strong wind gusts. Considering the rainfall totals in South West Sydney, which included 60mm at Bringelly, 69mm at Rossmore and 87mm at Badgerys Creek, I'd say the most intense/dynamic parts of the cell were to the south and north (reports of damage Richmond/Windsor) of here despite the ominous appearance to the monster towering over this location. The already flooded South Creek not to far from where I was that evening quickly rose again, and the taking into account the totals above I'm sure it continued to rise even further as the night went on, as those areas mentioned are part of the creek's upper catchment. 7th Feb: I was able to witness yesterday's storms in my home territory - the lower mountains. They were rapid to built and drop their load and due to this quick succesion, minimal organisation could be seen. Numerous seperate cells rolled over this area one after the other, pumping out copious amounts of driving rain, sheeting and spraying off every hard surface. Some gusts were strong enough to blow bark and twigs of trees. Some localised flash flooding to report of which is saying something about the rainfall intensity considering this is a mountainous area with porous soils. 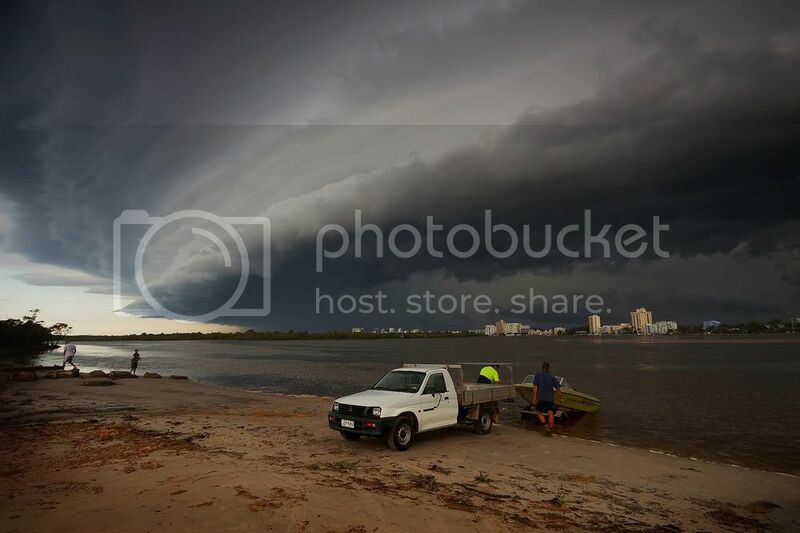 Yesterday a severe storm rolled through the Sunshine Coast and delivered this awesome shelf cloud. This is Maroochydore looking south. These are NOT my photos, they were shot by someone from the WZ forums. Thanks to Jake. When this storm passed through at 4 pm, it weakened on top of me, nonetheless it looked very threatening but resulted in nothing but a bit of wind and funnily enough, this shelf cloud developed to my east despite the fact I live close to the beach. That is quite spectacular and nice southeast Queensland shelf cloud. I know jeff Brislane once said that that region tends to have some of the most impressive shelf clouds you can ever ask for. As to severity, yes to me shelf clouds are associated with winds and heavy rain - not so much with very large hailstones. I guess what you experienced is not such a surprise. Great for pictures of course! I personally haven't seen anything as spectacular as this before in my area and in regards to severity, it brought back memories of the "good 'ol days" of my younger childhood when these big storms use to roll through and do quite some damage quite on frequent occasions, things have changed in recent years unfortunately so these kinds of spectacular events are a rarity. It's amazing at how such a beast can do so little damage, but I'm pretty sure the vicinity of my area was spared. The power, spectacle and beauty of nature is one of the reasons why I began my interest in the weather and it's just the tip of the iceberg! That first one is awesome! I have started trying to remember to carry the camera with me all the time "just in case" so I'm not limited to what I can catch on the mobile. Camera is only a small digital pocker size job, but shoots 7 megapixel so if a cloud like that comes up I should be prepared! The Southern Qld coast is probably one of the best places in the world to see outflow structure that large and impressive! I don't know why they get them more frequently there (even more so than NE NSW) , but they do. From what i've seen documented as far as rain hail and windspeeds go they very rarely have large hail and wind gusts over 100km/h unlike similar structured storms in the USA which often produce giant hail and 100mp/h wind gust's and which develop in much more volatile atmospheres than seen in Qld. Those shots are very impressive photogenically. Driving home from work along the M4 and looking at the storm west over Penrith was impressive. I decided to drive to Penrith and have a look at it. As I closed in on that storm, I observed banding of cloud and unique dark hues and colours that I have not seen for a while. I was caught in a traffic jam approaching Penrith. Just near the St Clair exit, I heard a report on 2UE radio of small hail falling at Glenmore Park. I watched a patch of cloud in front of me turn from a dark colour to a white colour which was over Glenmore Park. I took the St Clair exit, turned south, parked of the road and let that white area of cloud pass over me. It turned out to be a dumping of rain rather than the small hail. Rain was very heavy. There was little wind as the storm front passed over. There was allot of water or overland flow over the road where I was. After about 20 minutes I decided to drive NE back through Mt Druitt then Parklea following the core of the storm for at least 20 km. I drove through some very heavy rain. There was flooding along Powers Road due to the rain intensity. Part of Mt Druitt suffered a blackout and I passed one traffic accident most likely attributed to this storm. The area near Badgeries Creek and vicinity scored anywhere from 50 mm to 87 mm. There is a recorded fall of 74 mm near Ingleburn. I noted that I was in the vicinity of some of the areas that scored the higher rainfall totals and hence the flooding or overland flow that I observed either on the road or on the side of roads. Incidentally the storm weakened east of Parramatta and rainfall totals were quite light, especially over Sydney's north eastern suburbs. Before this storm hit western Sydney, I was watching on radar at work a significant storm system or squall line occurring on the New South Wales north coast. I had a look at it on a lightning tracker as well and noted some 16,400 lightning flashes in one hour from that system. Thursday lunch time, a small thunderstorm approached Auburn from the south dumping significant further rainfall over Liverpool and then Bankstown. However a new separate thunderstorm cell developed just to the north of Auburn at around 1 pm and the southern storm weakened just as the northern storm intensified. Quite interesting to watch the northern storm strengthening while the southern storm died into a light shower. That northern storm moved through Hornsby and Mona Vale. a) 14,000 homes blacked out at Sutherland following a powerful lightning strike on a power station at Menai. It hit a 132 kilovolt power transformer which caused a fire. b) A lightning strike onto power lines at Mona Vale plunging some 26,000 homes into darkness. c) Heavy further downpours at Liverpool and Bankstown with 30 mm falling. Although afterwards I saw one rain gauge part of the network in the southern Sydney area registering close to 50 mm of rain. d) There was an isolated heavy fall at Terry Hills to the north as well. After this event, a weaker storm cell moved through large areas of western Sydney from 4 pm to 6 pm dropping further rainfalls in excess of 20 mm before clearing northwards by 6 pm. That last storm caused traffic gridlock and chaos on Windsor Road and other roads and it took me more than 90 minutes to drive from Auburn to Bella Vista, a distance of 18 km.